I work in Workplace Management projects since a long time and troubleshooting was sometimes a nightmare, including with ConfigMgr. You had to read a lot of log files to recognize the core issue of a problem to be able to implement a solution. But I saw that only a small percentage of ConfigMgr Admins, can really understand the dependencies between all the log files and correlate the information correctly. So, a lot of people need just something much easier to solve their daily issues. Roger Zander built the Client Center for ConfigMgr which was the handy tool and helped a lot of ConfigMgr Admins by just enabling them to get a deep insight in what’s happening on a device and starting some remediation action like reset and refresh the policy. Now, I work in modern workplace projects with Intune and Azure AD. 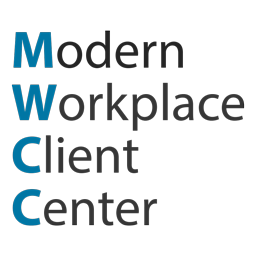 Imagine, troubleshooting is not getting easier, but now there is a solution, the release of the Modern Workplace Client Center. All functions are available as a PowerShell module, which can easily be installed from the PowerShell Gallery on every Windows 10 computer. In the future I plan to publish also a UI version. Troubleshooting processes should be simplified by automatic system analysis. Remediation of well-known issues detected by the analysis. For me it’s important to get feedback from you. If you experience an issue and found a solution for it, please send me as much information about how to detect the issue. Perhaps event id’s, log names, registry keys and the expected values. I made it simple as possible by adding the module to the PSGallery. Therefore, you can install the module by just triggering the following command on Windows 10. If you have never used the PS Gallery before, PowerShell will ask you to install some dependencies which will be downloaded automatically, if you approve it. Troubleshoots Azure Hybrid Join status and covers already 17 checks. Troubleshoots Windows 10 MDM Enrollment status and covers 6 checks. Retrieves information about all MDM assigned applications, including their installation state. Returns information about the Ownership of the Device. Resets Windows 10 MDM Enrollment Status. Get Windows 10 MDM Enrollment Status. Returns information about the execution of PowerShell Scripts deployed with Intune. Get-SiteToZoneAssignment –> Returns Internet Explorer Site to Zone assignments. This is more a helper function, but perhaps it helps you somewhere else. If you have any feedback for improvements don’t hesitate to use the Issue Tracker on Github.